One of the things that you can be relatively sure of when buying a new PC or laptop is that it will be filled with software that you do not necessarily need at all. PC manufacturers make a good chunk of money from those applications that ship with their PCs, and it is unlikely that you will ever encounter a system that does not contain a dozen or so programs and trial software. You could now go ahead and uninstall those applications manually which could take quite some time. The time depends largely on the number and type of applications on the system. Some users prefer an automated solution, and one of the best programs for the job is PC Decrapifier. Last reviewed in 2008, and updated two days ago, it is time to take a new look at the application. PC Decrapifier is a portable software for computer systems running Windows. It is compatible with all recent versions of the Microsoft operating system including 64-bit editions. The program walks you right through the steps to remove software that you do not need from the PC it is executed on. It suggests to create a System Restore point before the actual process. While that does not guarantee that everything can be restored, it is a good to take precautions if something goes haywire during the removal. 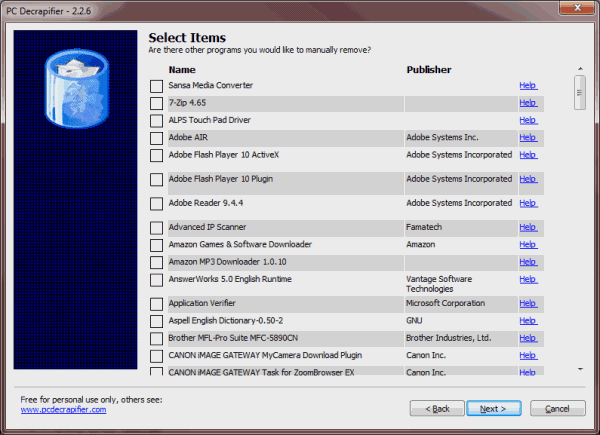 PC Decrapifier first scans for applications that is has listed in its list of applications that users do not necessarily want on their systems. Programs identified this way are displayed in list form after the scan. Each program is listed with its name and a short description which should give the user enough indicators to determine whether the program is of use or not. Some, all or no programs can be selected for removal on this screen. Some of the common programs that are identified by PC Decrapifier are the MSN Toolbar, ASK Toolbar, Microsoft Silverlight, Acrobat.com, Acer Registration, HP Advisor, Skype Toolbars or Dell's Getting Started Guide. A list of the top 50 applications is available on the PC Decrapifier homepage. All installed programs are displayed in the second step. Here it is possible to select programs that have not been picked up by the automatic application scan in the first step of the process. This is handy to add programs to the list of programs to be removed from the PC or laptop that have not been identified automatically by the PC software. It is interesting to note that PC Decrapifier can be used as a batch software uninstaller, as it is possible to add multiple programs to the uninstallation list. PC Decrapifier is a handy tool for users who have bought a new PC or notebook that shipped with many programs that they do not need or want on their hard drive. It is also a great tool for users who want to uninstall multiple programs from a Windows operating system in one go. PC Decrapifier launches the uninstallers of all selected programs in the end. The latest version of PC Decrapifier is available on the developer homepage. It is free for personal, non-commercial use. Does this program use the build in add/remove windows service ? If so, it leaves many files and registry entries behind. Ilev it uses the built-in uninstallers. Hoi Martin, does dis program a better cleaning job than the Revo uninstaller? With outer words does dis program find programs which Revo uninstaller does not find? And does dis program cleans better after himself the rubble what stays behind normaly, than Revo uninstaller? Paulus no it does not.